Manta rays are true gentle giants; though they can grow more than 20 feet wide from wingtip to wingtip, they eat only plankton. Swimming with these animals is a rare thrill for SCUBA divers, and manta-viewing ecotourism is worth over $100 million each year. 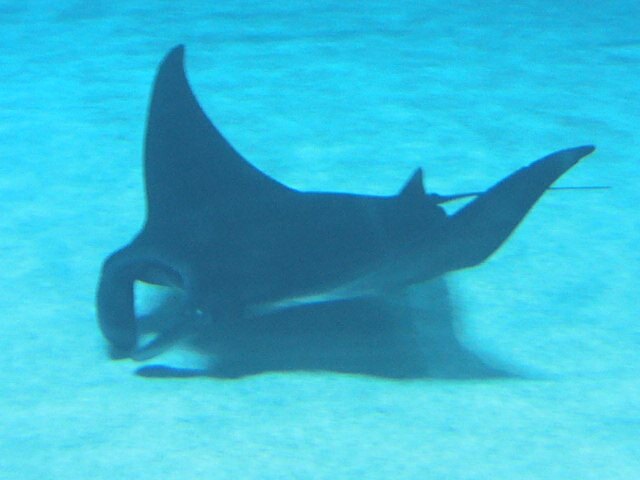 Like many species of sharks, manta rays grow slowly and reproduce rarely. According to Dr. Nick Dulvy of the IUCN Shark Specialist Group, ” they give birth to an average of one offspring every two years…they are a long-lived species with little capacity to cope with modern fishing methods.” They also migrate across huge distances, regularly crossing between national boundaries and spending much of their time on the high seas, making management difficult. By some measures, the global population of manta rays has declined by more than 30% in recent decades, with some local populations facing much larger declines. Earlier this week, an IUCN Shark Specialist Group team led by Andrea Marshall has concluded that both species of manta ray (the giant manta Manta birostris and the reef manta Manta alfredi) should be declared Vulnerable* to extinction. The IUCN Shark Specialist Group recommends that several steps be taken to protect mantas from further population declines. These include discussing the value of international conservation treaties, such as CMS and CITES, for both species as well as national-level policy changes in countries that fish for mantas. Some of these proposals may benefit from the support of the online conservation community, so please stay tuned! I’ll continue to report on these suggested policies as they moves forward. * “Vulnerable” in the context of an IUCN Red List status should be capitalized, as should other IUCN Red List statuses. For more information on what “Vulnerable” means, please visit the Red List website here.